Annan Athletic finished their Betfred League Cup matches with a 2 goal victory over East Stirlingshire at Ochilview on Saturday. It was a much needed win for Annan who had tasted defeat in their three previous Betfred Matches against Stranraer, Rangers and Motherwell. Annan boss Jim Chapman included his two recent signings Ryan Finnie and Aaron Bradbury a young left sided player recently released by Carlisle United. Both players made an impact on this game with Finnie opening the scoring on the 57th minute with a 25 yard thunderbolt and Bradbury looking very comfortable down the left flank. It was a no win game for both teams who were both playing to avoid the wooden spoon in their section and although goal scoring opportunities were few and far between it was Annan who lifted the points with Max Wright scoring a last minute penalty to add to Finnie’s earlier goal. Goalscoring opportunities were few and far between in a goalless first half, Annan were denied the opening goal in the 6th minute when Raffi Krissian’s header from a Max Wright corner crashed off the front of the cross bar. Barry Cuddihy was replaced by Ryan Finnie in the 26th minute having sustained an injury minutes earlier. East Stirling’s best chance of the half fell to Connor Greene when he headed past the post in the 42nd minute. After a goalless first half the shire started the second half with more promise with Ross Fisher shooting past the post, minutes later Bradbury’s effort went narrowly over the bar. Finnie’s reckless tackle on the edge of the box earned him a yellow card in the 55th minute but Paul Sludden’s subsequent free kick sailed past the upright. Finnie however soon made amends in the 57th minute when he picked up Max Wrights quickly taken free kick finishing with a superb 25 yarder which looped over keeper Darren Dolan and under the cross bar to give Annan the lead. Wright almost doubled the score in the 60th minute when his effort went over the bar. Przemyslaw Dachnowicz was introduced at the expense of David McKenna in the 67th minute. Darren Dolan then pulled off a good save to deny Krissian who was set up by Bradbury. Annan were enjoying a good spell in the game but they found the Shire defence a hard nut to penetrate. The home team pushed forward and started to impose themselves on the game for the final 10 minutes and substitute Andy Rogers set up David Grant with a clear chance but he finished poorly after being put under pressure by Swinglehurst. Annan were awarded a penalty in the final minute when Max Wright was pulled back after Przemyslaw Dachnowicz had released him in on goal. Wright converted the spot kick with a low shot into the keepers right hand side. East Stirlingshire – Darren Dolan, Graeme MacGregor, Scot Buist (Gavin McMillan 62 min), Connor Greene, Andy Grant, Ross Fisher, Paul Sludden, Derek Ure, Connor Hogg (Adam Murray 55 min), Dylan McGuigan ( Andy Rogers 72 min), David Grant. Substitutes Unused – Craig Comrie, Dean Shaw, Simon White, Lewis Peddie. 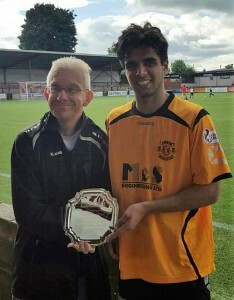 Annan Athletic – Blair Currie, Steven Black, Jean Guy Lucas, Raffi Krissian (Adam Ashgar 87 min), Peter Watson, Steven Swinglehurst, Rabin Omar, Barry Cuddihy ( Ryan Finnie 26 minutes), David McKenna ( Przemyslaw Dachnowicz 67 min), Max Wright, Aaron Bradbury . Substitutes not used Alex Mitchell, Scott Norman, Tony Riberio, Alex Mitchell.